By Laura - Malaysia - 21 Nov/03 - Viewed 2554 times. We landed at Kota Kinabalu airport at about 11pm on Tuesday the 18th of November after a long day of flights. There is a booth just outside the airport where you pay a fixed rate for taxis. It cost us RM15.50 to get to the centre of town. We had planned to stay at the Sinsuran Trekkers Lodge but when we arrived there was a sign on the door saying that it had moved. Unfortunately the taxi driver didn't speak any English. After five minutes of trying to get him to take us to the new location we eventually got him to drop us off at the other Trekkers Lodge in town. We were so tired that we didn't notice that we went into the KK Hotel instead. It was pretty grim and I wouldn't recommend it but it only cost RM20.00 for a room and we were planning to leave the next day. We got up at 8am the next morning with a few things to sort out. Mark needed a mac for climbing the mountain and we managed to find one for only RM13.50 in a shop in Wisma Merdeka. A pretty good bargain although the hood of the jacket would only fit a small child. We bought some high energy food for climbing the mountain and headed over to the long distance bus station. To get to the Mt. Kinabalu National Park you need to catch a bus to Ranau and get them to drop you off by the entrance to the park. We were pleasantly surprised when we were told the bus would be leaving in about 10 minutes and at 11:30 it actually pulled out and started driving off. However, the driver quickly changed his mind and pulled in again and we didn't get going for another hour. The journey took just under two hours and cost RM10.00. The entrance to the park now costs RM15.00 for foreigners. We paid this and then headed to reception to sort out our accommodation. 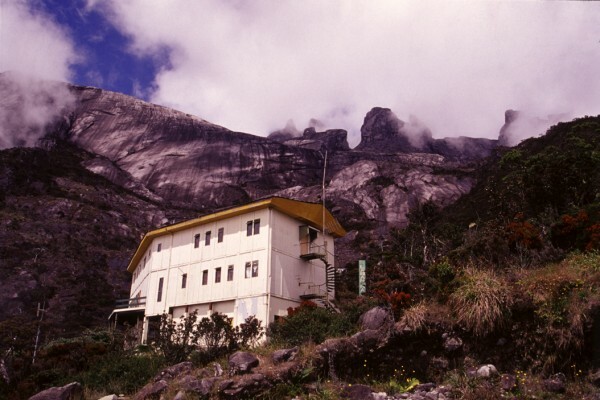 I had booked for us to stay in the Menggilan Hostel (RM11.50 per person) at the base and the Laban Rata Resthouse (RM32.60 per person) on the mountain using the Kinabalu Nature Resorts website. Once they confirmed the booking though I still had to phone up (or fax) to give them my credit card details. There are cheaper hostels on the mountain but the Laban Rata is the only one that is heated. We walked over to the hostel and repacked our things for the next day. You can store bags at reception for just RM1.00 so we just took small bags with us. In the evening we ate at the Liwagu Restaurant in the administration building. They have a good selection of Western and Asian meals. There is an exhibition centre upstairs which is worth a visit and has a stick insect that is absolutely massive. We went to bed early in preparation for the climb. In the morning we had a quick breakfast and were at reception by 8am. This was still too late to join a group though so we had our own guide, called Jennius. The costs for climbing the mountain are RM100.00 p.p. for the climbing permit (this has been doubled recently), RM3.50 p.p. for insurance, RM60.00 for up to three people to share a guide and RM25.00 for up to five people for the return minibus to the start of the walk. At the start of the walk I was beginning to wonder why I was doing this, but after a few minutes I got into a rhythm and the first couple of kilometres went quite quickly. I was surprised that we started to overtake porters on the way up because the ones on the Inca Trail were so fast. It made sense though when our guide explained that they were carrying between 30 and 40 kgs of rocks for a building at the 4 km mark. On the first day you climb 6 kilometres from the base (with markings every half a kilometre) to your accommodation which is at 3,300m. It is quite steep with a lots of high steps to climb. It took us 4 hours and most people complete it in 3 to 6 hours. After checking in to our dorm room we were able to have a hot shower. We then slept for a couple of hours before going down for some dinner at about 5pm. Mark had the buffet dinner while I had spaghetti. At one point the clouds cleared and we could see the mountain above us. We spent a couple of hours there chatting to people before going to bed at 7pm. The next morning we woke up at 2am in order to start climbing at 3am. For parts of the climb you have to pull yourself up with ropes so it is useful to take gloves with you. From the 6 km mark it is a further 2.7 km to the summit. It is a struggle, especially as the summit is at 4101m, and the altitude affects people to varying degrees. We did not spot the 7.5km marking and were almost ready to give up by the 8km one. Mark suffered worse than me but we made it to the top at 6am just in time for sunrise. It can get very cold at the summit so it is best not to arrive too early. I was glad that I had hired a jacket from the resthouse for RM10.00 and wasn't too cold. There was even a rat up there seeking out crumbs. It was amazing to see the mountains shadow over the country below. We were very lucky because it isn't clear up there every morning. After taking a few photos and having a snack we started the return journey. There was a bit of a traffic jam on the way down so we didn't get back to the resthouse until after 8am. We had a bit of a rest and some breakfast before continuing the climb down. As it had taken 4 hours to get up to that point I was expecting to get down in a couple of hours but it took 3 hours. We probably took a few too many stops and my legs were very wobbly by the bottom. There was a bus waiting at the end, which took us to reception. You can buy a certificate here for RM10.00 but we didn't bother. We had some lunch and collected our bag before deciding where to visit next.